When you think of Rock & Roll you think of Led Zeppelin. They are a truly iconic band that have reshaped the world of music as we know it. 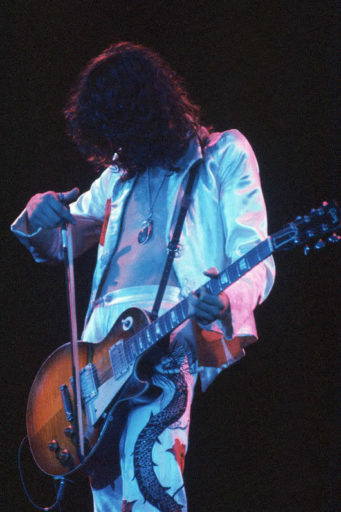 At the core of Led Zeppelin is legendary guitarist Jimmy Page and his coveted guitar tone. 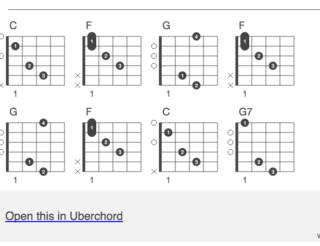 This is a tone that has inspired generations of guitarists over the past decades and continues to do so to this day! We will take a look at ways you can achieve this famous tone by looking at the guitars, amps, pedals and accessories used by the man himself! When you think of Page the image of a sunburst Gibson Les Paul immediately comes to mind. The guitar in question is the 1959 Les Paul Standard. However, Page was very experimental with his tones and was no stranger to changing things up. In his early days, in the Yardbirds and the early Led Zeppelin days, he used a 1959 blonde Fender Telecaster. 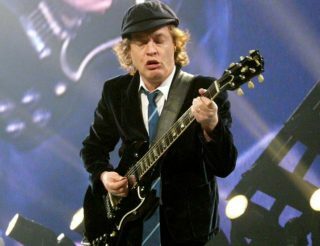 Page is most known for his iconic use of the Gibson Les Paul. The 1959 features a solid, mahogany body and neck, double carved maple top, custom bucker pickups and rosewood fingerboard. Gibson actually has recreated the 1959 Les Paul exactly to the original specifications. If you are really a Jimmy Page fan and want to be as legitimate Jimmy Page himself, this would be the best thing to get! For anyone who is looking to attain that classic Page sound, but don’t want to break the bank, have no fear! There are plenty of options that will faithfully bring Jimmy Page’s tone into your world! All of these guitars will get the job done. They all have mahogany bodies and necks and feature a rosewood fingerboard. What will be different is the overall playability and the quality of the woods. The more expensive the guitar, the higher quality woods it is made from. The 1959 Les Paul is unique because it has a very vintage feeling neck that is quite different, and a little bit larger than the modern guitar neck. A massive part of the Les Paul sound, in addition to the woods are the humbucking pickups. These supply a nice full, warm sound. 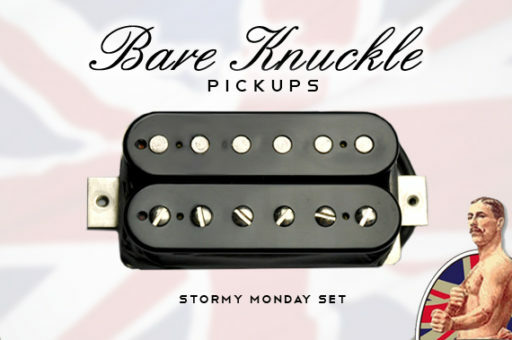 If you have a guitar with humbuckers you should check out these pickups! All of these selections are pickups designed to create a vintage sound, meaning they model pickups that were around in Jimmy Page’s prime. 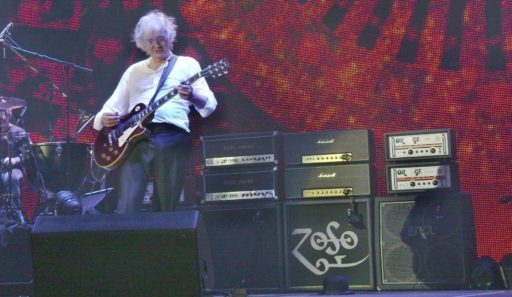 In addition to his faithful usage of the Les Paul, Page is famous for using Marshall amps. Frequently stacking many of them! When he was playing with the Yardbirds, before joining Led Zeppelin, he used a combo amp in the studio and when he played live but when he began touring with Led Zeppelin he switched over to Marshalls to get more volume whilst performing. This makes a lot of sense because volume is a very important part of Page’s sound. 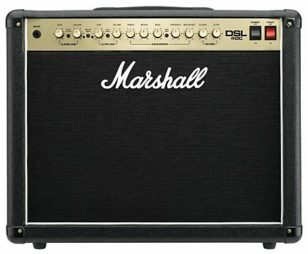 The first amp I could recommend in the pursuit of Page’s classic tone is the Marshall DSL40c. This is a 1×12 all tube combo amplifier that is in the $600-$700 range. It is small, full of the classic Marshall tone and at the same time is a great value! If you are looking to dish out a little more cash here are some more high end options! Page now frequently uses Orange amplifiers. He is known to use the AD30 head. 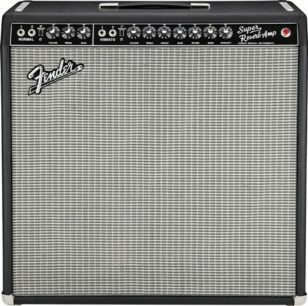 According to those who use this amp “you get a frothy, vintage-style tone that purrs and growls like a big cat when you push it”. This is exactly the kind of amp you want to have when recreating Page’s tone. 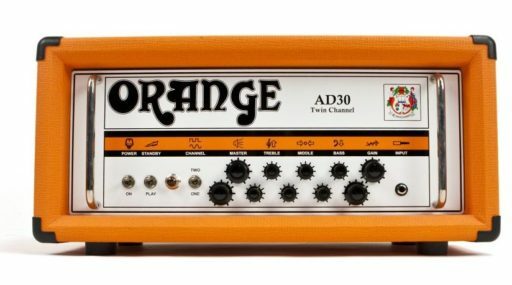 Orange is known for their high quality amplifiers and this is no exception. The AD30 features 9 tubes (thats right 9!) and 2 highly independent channels. In terms of amp settings, as I mentioned before, volume is a massive part of the Page sound so be sure to crank it! Keep the gain and the bass around 7 o’clock and boost the treble and high end controls. 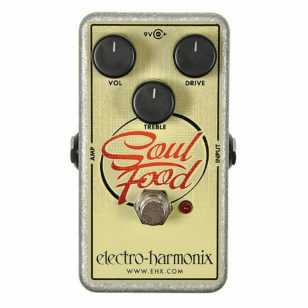 The trick is to have a loud, pushed but not overly dirty tone with lots of high end and sustain. Page was a known experimenter when it came to sound. 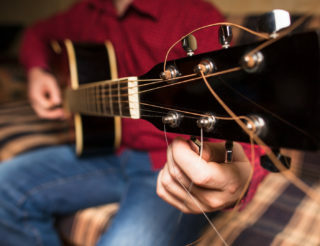 He is famous for experimenting with tuning and even using extended techniques like using a bow on the guitar! He was just as inquisitive when it came to pedals and sound design. The three main pedals you should have are a Wah pedal, a fuzz box and a tape delay pedal. 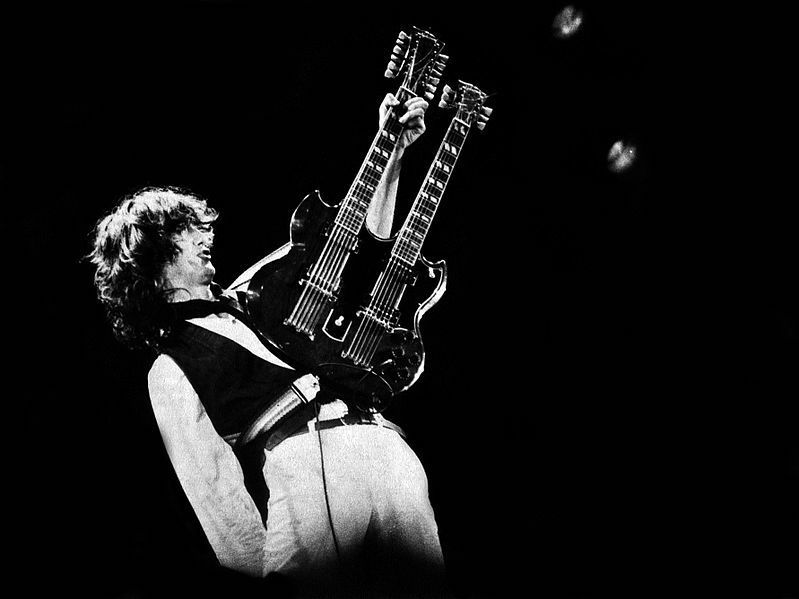 Page would often utilise a Wah Wah pedal during some of his solos and some of his rhythmic parts. There are a tone of different manufacturers of Wah pedals to choose from, one of the most common is the Dunlop Crybaby. This is the classic Wah pedal and supplies you with that warm, sweeping filter that dominates the guitar playing of the 60’s and 70’s. If you want to hear Jimmy use his Wah in action check out “Dazed and Confused” as well as “No Quarter”. 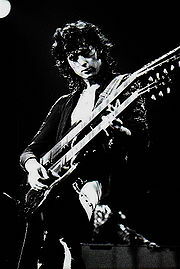 Page would also often utilise a fuzz box, a box that produces an intensified distortion effect that creates a fuzz like tone. It is traditionally a little noisier and rougher than the common distortion, it is certainly a great texture to get into! A great fuzz pedal is the Electro-Harmonix Big Muff . This will supply you with some hard hitting distortion that Page used in the more heavy hitting Zeppelin tunes. Lastly, Page often used a tape echo pedal. Tape echo is a little different from delay. It is a bit darker than traditional delay and it is meant to simulate analog tape echo. Some delays can sound a bit lifeless but tape delay is a nice warm, darker, pure sound. 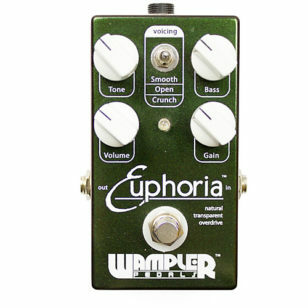 A great pedal to check out is the Wampler Tape Echo. If you are going for the Page sound but don’t want to buy a new amp, an overdrive pedal is the solution for you! Simply, pick the pedal that is right for you and use it when your amp is on the clean channel. Here are some pedals to look into.